Stan Allen will present the lecture "The Geological Turn" as part of the Spring 2013 Student Lecture Series. Stan Allen is a practicing architect and principal of SAA/Stan Allen Architect. From 1989–2002, Allen taught at Columbia University's Graduate School of Architecture, Planning and Preservation, where he was also the Director of the Advanced Design Program. Stan Allen was the Dean of the Princeton University School of Architecture since 2002. After working for Richard Meier and Partners in New York and Rafael Moneo in Spain, he established his own practice in 1990. His built work to date includes galleries, gardens, workspaces and a number of innovative single-family houses. Responding to the complexity of the modern city in creative ways, Stan Allen has developed an extensive catalogue of urbanistic strategies, in particular looking at field theory, landscape architecture and ecology as models to revitalize the practices of urban design. His urban projects have been published in Points and Lines: Diagrams and Projects for the City (New York: Princeton Architectural Press, 1999, reissued in 2004) and his theoretical essays in Practice: Architecture, Technique and Representation, reissued in 2008 by Routledge. Landform Building: Architecture's New Terrain, a 450 page book based on the conference held at the School in 2009, was published by Lars Muller in 2011. From 1999–2003 he worked in collaboration with James Corner/Field Operations. The work of this interdisciplinary collaboration was recognized with first prizes in invited competitions for the re-use of Fresh Kills in Staten Island (2001), and the Arroyo Parkway in Pasadena, California (2002). In 2000 they won the competition for a garden at the French Consulate in New York (now complete), and were finalists in the competition for the 320-acre Downsview Park in Toronto. In 2007, SAA/Stan Allen Architect won the international competition for the redesign of the Taichung Municipal Airport in Taiwan, which is now being implemented. Recently completed buildings include the Sagaponac House, Salim Publishing at Paju Book City and the CCV Chapel in the Philippines. The firm has recently been recognized with P/A Awards for the Taichung Airport and the Yan Ping Waterfront in Taipei, AIA Awards for the CCV Chapel and Salim Publishing, and an Architecture Award from the American Academy of Arts and Letters. The recently completed Taichung InfoBox won both AIA andP/A Awards. He lectures and publishes extensively, both in the US and abroad, and participates in numerous international design conferences and symposia. 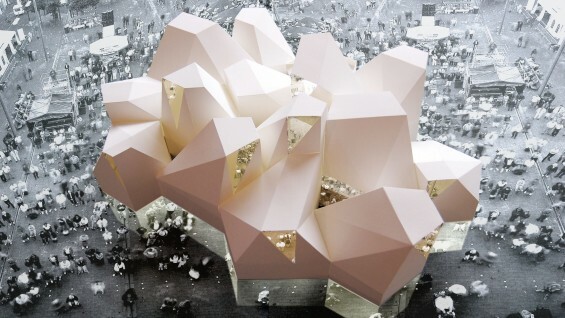 In addition to design awards and competition prizes, he has been awarded Fellowships in Architecture from the New York Foundation for the Arts, The New York State Council on the Arts, a Design Arts Grant from the National Endowment for the Arts, a Graham Foundation Grant, a President's Citation and the 2009 John Hejduk Award from The Cooper Union. In a ceremony held in New Orleans in May, Stan Allen was elevated to the College of Fellows of the American Institute of Architects.